Laptop computers are becoming more and more popular in medical settings. Laptops are easy to transport, cost-effective, and many models have the same features as a standard stationary computer setup. If you plan on integrating laptop use into your practice, an industrial laptop cart will help improve workflow and increase the quality of care and output in your practice. 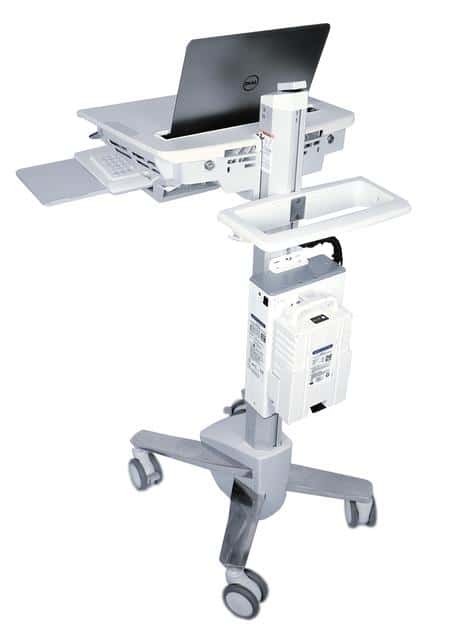 An industrial laptop cart is different than a standard medical computer cart but does feature some of the same features. While a laptop cart is somewhat smaller than a standard computer cart, it’s important that it has adequate table space so administers can write notes or place objects on it in addition to the laptop itself. It should be maneuverable with quality wheels and locking brakes to ensure stability. Your cart should be durable. Some poorly made laptop carts have a tendency to break easily or do not securely keep the laptop in place during transit. 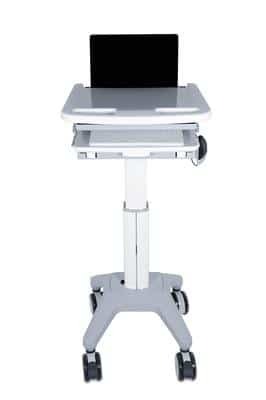 Most medical carts also come with battery hook up or cord management system to help you keep your equipment charged and running at all times. Scott Clark offers a fully customizable line of laptop carts to help meet your needs and the needs of your practice. The industrial laptop cart you choose is a worthwhile investment in the longevity and prosperity of your business. Not every setup is ideal for every situation, so it is important to have customizable options to help meet your individual needs. Being able to provide more point of contact care, reduce your energy output, remove unnecessary clutter from patient rooms, and improve workflow and productivity will help increase your quality of care and bottom line.